If the .com is taken, should I settle for .co? This is a great question, and I get it often. So often that I decided to write a blog post without first doing keyword research. 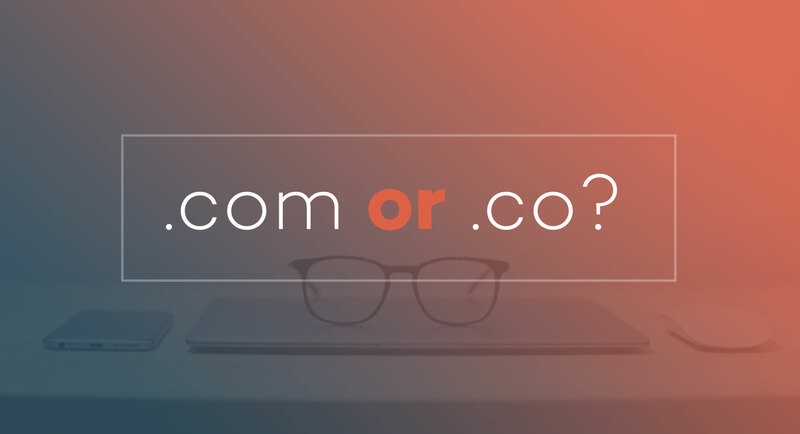 To answer the question “if the .com is taken, should I settle for .co”, depends largely on the situation. To make things harder, the situation your business is in, changes over time. Therefore the decision you make today may prove to be wrong in a few years after the market conditions change. Here are some key factors I suggest you take into consideration before making a decision. 1. Is this a long-term project? If this is a one-off thing or a side-hustle blog, you can certainly get by without investing a few thousand dollars in a good .com domain name. On the other hand, if this is your “baby”, and you plan to invest the next decade into building this project you may want to invest in a great name. This will spare you money and time you will have to spend later on rebranding. Do you remember in school when there was a kid with a funny name? Everybody knows that kid, and that person is stuck with that name for the rest of its life. Don’t make that mistake. It is not easy being teased and calling you funny names all the time. 2. Is that particular .com domain name worth it? If you go to Sedo, Flippa or any other domain name marketplace you will see a ton of domain names for sale. May are so overpriced it’s ridiculous. Mind you, I am not saying great domains are not worth the price, they sure are! What I am saying is don’t pay a ton of money for something that it just so happens you aren’t able to get for the base price. This is also called the “grass is always greener on the other side”. It happens to everybody! Yes, these 10 domain names that are available for registration are awful. But this one that is registered, oh, I like that one so much I’ll sell my kidney in order to get it. Don’t fall for that, and evaluate the real price of this domain name. 3. If the .com is taken, should I settle for .co? This is the wrong question to ask because it presupposes these are the only two options out there. You need to get out of this frame of thinking! In my opinion, I would always go with a .com, unless I really like the name with the new TLD (like webmaster.ninja, vegan.club, check here some other nice combinations) and there’s no way I can afford the .com or if I conclude it is not worth it. The question you really need to be asking yourself is: “What is the very best domain name I can afford?”. Once you get inspired, you can check for domain availability here. That’s how I found a domain name for this website. 4. Am I thinking like an investor? When you are buying a domain name, you need to be thinking like an investor. Yes, there are great courses to get you started and there are automated tools that help you evaluate the cost of a domain name but you should at least know what you are getting into to. Check services like Namebio to check other similar names, or even if your domain name has been sold in the past. You wouldn’t buy a plot of land without considering some serious thought, would you? Even domain names like Google.com, Youtube.com, and Instagram.com were at one point bought for $10. Sure, some found their new owners for hundreds of thousands of dollars (instagr.am became instagram.com), but at one point they were bought for the base price. I am not saying your company is going to grow like TheFacebook.com in the early days, but it is possible to avoid some pitfalls. The domain name can be a great asset or just some “address” that you type in. 5. I have a business and a name, it’s time to go online. You need to pay the money that’s being asked for the .com domain name and negotiate during that process. I’ve seen companies pay hundreds of thousands of dollars, giving equity in return for the domain ownership and other big leaps, just in order to get that .com domain name. I thought I said 2 options? Well, I know some of you are going to hate the first two so much, you are going to disregard me as an expert. So, here’s a bonus option. Keep doing what you are doing without the website, until you have the money for a great domain name. There’s no point in going after the global market with a bad domain name. If you are going to save money on a domain name, you are probably going to tighten the budget on a website, and the social media accounts (the handle, such as facebook.com/ourcompany) are probably not going to follow the guideline Michael Cyger shared with us in an interview. Ok, let’s recount the advice I’ve given here.